Chambray shirts are a staple in most wardrobes. Who doesn’t love their practical ease and soft comfort? You’ll even see these shirts on the streets of Paris. Sadly, most chambray shirts are made out of cotton. Cotton wrinkles easily and dries slowly. It is usually a poor fabric for travel. Happily, an alternative fabric exists – Tencel/lyocell. 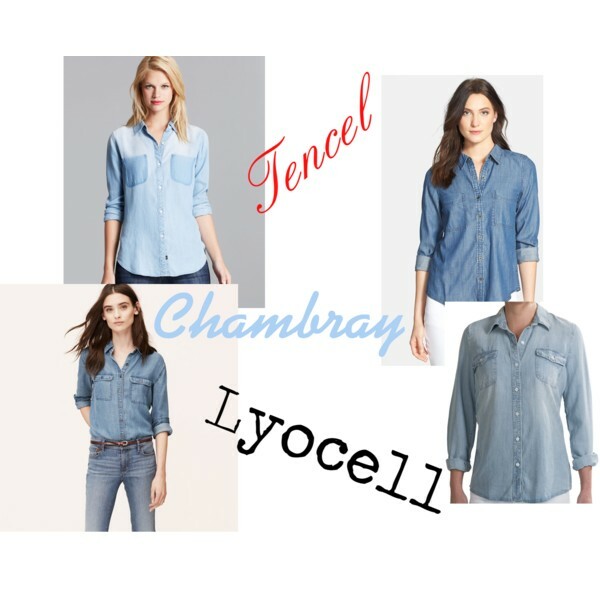 Tencel chambray shirts are a wonderful alternative to a beloved favorite. It absorbs water, giving it great cooling power. This means it won’t keep you warm when wet (bad for backpacking in a storm). Over all, Tencel/lyocell is a great choice for those hot summer trips. The quick dry and wrinkle resistant properties make it great for travel. it has a figure flattering soft drape. Several companies carry Tencel chambray shirts. They are easiest to find in the spring when chambray shirt collections come out. Tencel is expensive to produce, so you’ll pay a little more for it. You’ll find that it is worth every penny the first time you wash it! Think about upgrading to Tencel the next time you buy a chambray shirt (or any other shirt for that matter). Tencel is a magical miracle fabric and I’m jealous that it’s more often used in women’s clothing than men’s. It has properties quite similar to merino wool (except for warmth, as far as I can tell), which is the undisputed champion of high-tech fabrics, but Tencel can be significantly cheaper, as well as vegan-friendly, for those who prefer it that way. Someday! You’re right! Women do have a greater selection of tencel products. Maybe because the softness is considered feminine? It seems so unfair. Orvis and Tilley carry men’s tencel denim shirts, so they are out there. Hi. I have learned a lot of great travel packing ideas from your site. But I am afraid I am not a fan of rayon/tencel for travel. It is heavy and it dries slowly, so not good if you need to handwash. Like most fabrics, tencel/rayon comes in a variety of weights. There are certainly some tencel fabrics that have the same weight as jeans. That would be a poor choice for travel. There are others that are significantly lighter. I always advise a summer weight fabric for travel as it dries significantly faster than a medium or heavy weight material.